Plentiful sunshine. High 76F. Winds S at 10 to 20 mph..
Effingham graduate Mason Hull (25), now at Missouri State, is projected to be the top freshman in the Missouri Valley Conference. 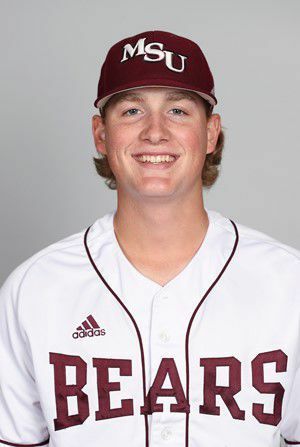 Baseball America projected Missouri State’s Mason Hull, a 2018 Effingham graduate, as the Missouri Valley Conference’s Freshman of the Year. Millikin freshman Brigid Duesterhaus was named the College Conference of Illinois & Wisconsin (CCIW) Women's Swimmer of the Week. Duesterhaus, a MacArthur graduate, won three events in the Big Blue's final dual meet against Lincoln College on Saturday. She took first in the 200-yard IM with a lifetime best time of 2:21.40 and won the 100-yard backstroke with a time of 1:03.79. Duesterhaus clocked the fastest 50-yard freestyle split with a lead-off time of 26:15 on the winning 200-yard freestyle relay (1:46.41) to close out the meet. Millikin won the meet by a score of 138-55. The Millikin wrestling team won three individual titles and finished in second place in the team competition at the CCIW Wrestling Championships hosted by Elmhurst College last week. Millikin finished two points behind North Central College 133.5 to 131.5. The second-place finish ties last year’s mark as the best team finish in school history. Millikin senior Chris Williams and sophomores Tristan Birt and Bradan Birt won CCIW individual titles. Six Millikin wrestlers joined the trio earning All-Conference honors by finishing in the top three in their weight class. Millikin coach Ryan Birt and North Central’s Joe Norton were named CCIW Co-Coaches of the Year.